When a small child, my parents emigrated to the state of Vermont, where they lived about nine years, and in 1813 they let me go with my Uncle Joel Hills (for whom I was named), to New Port, in Kentucky, on the opposite side of the Ohio River from Cincinnati, Ohio, both small towns at that time. In the spring of 1815, father came and took me to Pomfret, Chautauqua County, New York, where I lived with him until I was twenty-one years of age, March 25, 1823. I had little or no opportunity for an education, but was very religious from a small child, not daring to transgress the will of my parents or do the least thing I thought to be wrong, and always attended religious meetings and studied my books by firelight after I had done my work. I bought a sawmill and lot of land and built a house and had my sisters keep house for me, until the 2nd day of November 1826, when I married Anna P. Johnson, daughter of Timothy Johnson, squire. She was born August 7,1800. In the year of 1829, I invented and patented the shingle cutter, or the machine now used to make shingles throughout the United States and Canada. The patent is dated 8 December 1829 and signed by Andrew Johnson, President, and Martin Van Buren, Vice President of the United States. In the fall of 1830, I moved my family to the town of Amherst, Lorain County, Ohio. I there first became acquainted with The Book of Mormon and the Elders of the Church of Jesus Christ of Latter-day Saints, and was baptized into the church on the 1st of June 1831, and was ordained an Elder on the 20th of September following and appointed to preside over the Amherst Branch of the church, numbering about 100 members. I attended the first October Conference of the Church. It was held in Orange Townsite, Ohio, in October 1831. It was here that I first beheld the face of the Prophet Joseph and heard the words of life from his mouth which filled my heart with joy and thanks to God. In January 1832, I went on a mission to the state of New York, preaching the Gospel and visiting my father's family in Pomfret. They willingly heard and believed and my mother and some others were baptized. On my return home, I baptized many in and about Amherst, and ordained several Elders and Priests. In July, 1833, President Smith counseled me to move to Kirtland and buy out certain obnoxious individuals, which I did. I was there when the foundation of the Temple was laid, and built a sawmill for its benefit. On August 26, 1835, I went on a short mission throughout the Southeast part of Ohio, preached in many cities and towns, baptized several and returned home. I labored, preaching in all the about Kirtland, baptized many and ordained Elders and Priests. I received a blessing under the hands of the First Presidency for my labors in preaching and assisting in building the Lord's House. I was present at the calling and ordination of the first twelve apostles, also at the calling and ordination of the different quorums of the church. I attended the dedication of the Lord's House, on the 27th of March, 1836, and all the meetings and councils that followed, saw and heard the power of God manifested as mentioned in the life of Joseph Smith, and was chosen a member of the quorum of Seventies, so went on several missions, etc. I helped to organize the Kirtland Camp in 1838, and traveled with it as far as Springfield, Illinois, when I was called by the council to stop there and take care of the sick. I commenced preaching and soon gathered a branch of the church of forty members, over which I presided until January 8, 1839, when the Lord showed me by revelation that I must immediately go to Carthage in Hancock County. I packed up, went with my family and commenced preaching in Carthage and vicinity, and baptized many and orgainzed a branch of the church of about fifty members, called the Crooked Creek Branch. About that time Sidney Rigdon, Bishop Partridge and others called on me while on their way to old Commerce to seek a location for the saints who were being driven from Missouri. The location was made and called Nauvoo. In February 1840, I purchased a sawmill and a piece of land on Crooked Creek, on which I moved with my family. In July, we as a branch of the church were organized into a Stake of Zion, with all of its officers and quorums. I was ordained a High Priest and President of the Stake, under the hands of Hyrum Smith. A town was laid out and built up by the saints. On the 11th of September, 1840, my wife Anna died, leaving me with five small children. On the 20th of October following, I married Susan Bryant. In the winter of 1842, President Smith and council thought it best to disorganize the stake on account of a secretly organized band of false brethren that had crept in amongst us, and I was honorably discharged from further duties as president. I was eight miles from Carthage when Joseph and Hyrum Smith were slain on the memorable 27th of June, 1844. On the 13th of November following, I was appointed to preside over a small branch of the church called the Pleasant Vale Branch. On the 25th of October 1845, I took to wife, Miss Janet Fife, a Scotch lady. On the 31st day of December, myself and wife Susan received our endowments in the Lord's House in Nauvoo. On the first day of May 1846, about 2 o'clock at night, I was called to the door by an armed mob of about 100 men who had surrounded my house and asked if I was prepared to leave. I told them I was, they told me if I was not gone by July 1st, my life would be taken, and my property destroyed, and after more threats they left. Out of four or five thousand dollars worth of property, I owned in Hancock Co., Illinois, all that I could raise to help me away with was one horse team, worth $75, and one yoke of oxen and a borrowed wagon. On the last of May, I loaded my family into the wagon, leaving everything else behind, and started for Knox County, Illinois, where I had claim on an eighty acre soldier right of land, and arrived there on the 7th of June, 1846. While in Knox County, the Lord blessed me with means in a wonderful manner so that by the 6th of May, 1848, I was able to start for Salt Lake City with three wagons and sufficient teams, well loaded with family necessaries, provisions, tools, et cetera. With a few cows and sheep, we arrived at Winter Quarters on the Missouri River the first week in June. We tarried there four weeks waiting for a company and started on the 5th of July in Willard Richard's company. We arrived in Salt Lake on the 9th of October, 1848. I stopped at the mouth of Mill Creek Canyon and was ordained bishop of Mill Creek Ward and elected Justice of the Peace and a member of the Legislature of Deseret for 1849-50. In the fall of 1850, I was selected to assist George A. Smith in forming a settlement at Little Salt Lake (Parawon). I sent with him my two oldest sons, with two teams loaded with provisions, seed, farming tools, iron sawmills, et cetera and in the spring I went down with stock and several more teems, laden with necessaries for a new settlement. At the organization of the City of Parawon, Iron County, Court and high Council, I was elected one of the City Council, selectmen and one of the High Council and on the 19th of November, 1851, I was sent by George A. Smith, to the springs twelve miles south of Parawon to make a fort, and myself a farm, and herd the stock for Parowan and Cedar City. The name is still called Fort Johnson. In the fall of 1855, I attended a second Judicial District Court, held in Fillmore, Utah, as petit juror. December the 10th the Legislative Assembly convened in the State House at Fillmore, and I was selected Chaplin of the House, which office I filled. In the spring of 1857, I was called on a mission to the states, and started on the 6th of April, arriving at Florence on the Missouri River on the 13th of June, and returned to Salt Lake again on the 5th of October, 1860. On the 11th of June I went to President Young's office, and had Miss Margaret Threlkeld, an English woman, sealed to me by the President. I arrived at my home in Iron County the 20th of October having been absent over three years. My labors were mostly preaching the Gospel in Iowa and Nebraska. In the fall of 1861, I moved my families down the Virgin River. 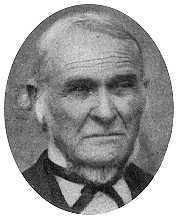 I was then sent by President Erastus Snow, up North Creek six miles to build a sawmill, which I accomplished and planted out large orchards and vineyards, and made many improvments. In July, 1866, I sold out on North Creek and moved back to Virgin City, and on the 1st of March, 1868, I moved to Bellevue, my present place of residence. After I was baptized in 1831, I never lived long in one place while in the states on account of mob violence, and since I have been in Utah, I have made my home in 11 new places. I was never called on a mission in regards to my faith or the glorious hope that is within me, or the mission of Joseph Smith, or the true principles of life and salvation through the fullness of the Gospel in the last days, that I excused myself. I was with Joseph Smith when the Word of Wisdom was given, and have strictly harkened to its precepts, from that day to the present, by not using tobacco, strong drinks, tea or coffee, and but very little flesh. I have written nearly 1000 hymns and songs, now in manuscript entitled "Zion's Songster" or the "Songs of Joel" a few of which have been published in the Church Works. In this short sketch of my life I have mentioned but a few of my labors and travels in the kingdom. My testimony for the last forty-eight years has been, and still is, that I know that God lives, for I have felt His hand and heard His voice, and I also know that the dispensation of the Fullness of the Gospel brought forth through Joseph Smith, is the work of God, for His voice has declared it unto me, as it did on the Saints on the day of Pentecost for my mouth was opened and my tongue was loosed, I could pray and preach day and night and I had the gift of tongues. I could remember everything I had read in the Bible or other books, thus fulfilling the words of Christ, speaking of the Comforter, that it shall bring things to our living human being upon the earth, Truth, Eternal Truth, even so, AMEN. (Signed) Joel H. Johnson, High Priest and Patriarch in the Church of Jesus Christ of Latter-Day Saints, the only living and true church of God on the face of the earth. (Grandfather Johnson moved from Bellevue to Johnson, Kane County, Utah, in October 1880. After he moved to Johnson, he gave all his children and grandchildren a patriarchal blessing and promised all of them that the words he pronounced upon their heads would all come true, inasmuch as they obeyed the Word of Wisdom). Joel Hills Johnson died 24 September 1882, at Johnson, Kane County, Utah. I just found your blog today. Thank you so much for putting these wonderful records online.